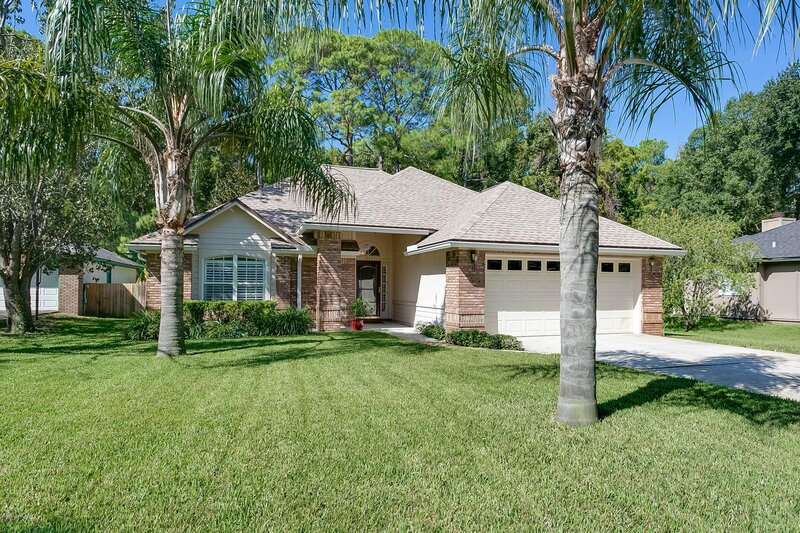 Pride of ownership shows in this immaculate updated home on awesome preserve lot! You don't want to miss out on this one! Perfection inside and out! Featuring beautiful plantation shutters throughout, laminate flooring in the large family room that features a wood burning fireplace and vaulted ceiling. Fully equipped kitchen with tile flooring, granite counters, breakfast bar, breakfast nook & upgraded stainless appliances. Spacious master suite with large walk-in closet, updated master bath. Off the family room you'll find a dining room with french doors, would also make a great home office. Secondary bedrooms feature newer carpet as well as the dining room. Outdoor living is over the top, you'll enjoy the large vaulted custom built pavered lanai with roof line extended from main house. Featuring two upgraded ceiling fans and a place to put your big screen TV to watch those weekend football games. Just off the lanai, you'll find a custom built fire pit just waiting for s'mores on a cool fall/winter night. Fully fenced back yard, and there is even room for your boat! Gate with double entry on side of home. Not one but two sheds for extra storage! Freshly painted exterior, 4 years new - 50 year Architectural shingle roof! Water Softener! Energy sealed attic! Don't miss out on this one owner home! Lovingly maintained and just waiting for new owners! Listing courtesy of RE/MAX SPECIALISTS. Selling Office: THE LEGENDS OF REAL ESTATE.